Scene of a kabuki performance. The screen on the right hides the musicians. Kabuki (歌舞伎, kabuki) is a form of traditional Japanese theater. Kabuki theater is known for the stylization of its drama and for the elaborate make-up worn by its performers. A rich blend of music, dance, mime, and spectacular staging and costuming, it has been the chief theatrical form in Japan for almost four centuries. The term kabuki originally suggested the unorthodox character of this art form. The individual kanji characters, from left to right, are ka, meaning “sing” (歌); bu, signifying “dance” (舞); and ki, meaning “skill” (伎). Kabuki is therefore sometimes translated as "the art of singing and dancing." Kabuki has changed drastically since its earliest incarnations. The history of kabuki began in 1603, when Izumo no Okuni, a miko (young woman in the service of a shrine) of Izumo Taisha Shinto, began performing a new style of dance drama in the dry river beds of Kyoto. Okuni had started yayako odori (children’s dance) around 1598, but as she became an adult, she changed its name to kabuki odori (kabuki dance) after kabuki mono (leaning people), youths who strode through the streets in flamboyant dress, sporting unusual hairstyles and unconventional accessories. 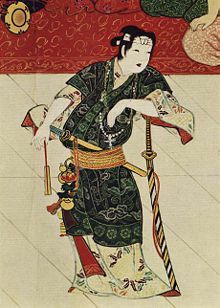 Okuni adopted their style of flamboyant dress, wearing a man’s hair style, a cross hanging from her neck, and a long sword. With a woman who worked in a tea shop (now equivalent to a bar), she performed dances daily wearing men’s clothing. Her kabuki dance became popular among the oppressed lower classes of the feudal society, and a small permanent theater was built in Kyoto. Female performers played both men and women in comic vignettes about ordinary life. The entertainment was instantly popular; Okuni was even asked to perform before the Imperial Court. In the wake of such success, rival troupes quickly formed, and kabuki was born as ensemble dance drama performed by women, a form very different from its modern incarnation. Much of its appeal during this era was due to the ribald, suggestive performances put on by many of the imitators. The raucous and often violent atmosphere of kabuki performances attracted the attention of the ruling Tokugawa shogunate, and in 1629 women were banned from the stage, allegedly in order to protect public morals. Some historians suggest that the government was also concerned by the popularity of kabuki plays that dramatized ordinary life (rather than the heroic past) and enacted recent scandals, some involving government officials. Since kabuki was already so popular, young male actors took over after women were banned from performing. Along with the change in the performers' gender came a change in the style of the performance; drama was emphasized rather than dance. Their performances were equally ribald; audiences frequently became rowdy, and brawls occasionally broke out, sometimes over the favors of a particularly handsome young actor, leading the shogunate to ban young male actors in 1652. From 1653, only mature men could perform kabuki, which developed into a sophisticated, highly stylized form called yarō kabuki (野郎歌舞伎, roughly "men's kabuki"). This metamorphosis in style was heavily influenced by kyogen comic theater, which was extremely popular at the time. Today the yarō has been dropped, but until relatively recently, all roles in a kabuki play were still performed by men. The male actors who specialize in playing women's roles are called onnagata or oyama (both 女形). Onnagata typically come from a family of onnagata specialists. Two other major role types are aragoto (rough style) and wagoto (soft style). Kabuki thrived during the Genroku era. The structure of the kabuki play was formalized during this period, as were many elements of stylization, and conventional character types were established. Kabuki theater and ningyō jōruri, the elaborate form of puppet theater that later came to be known as bunraku, became closely associated with each other during this period, and each has since influenced the development of the other. The famous playwright Chikamatsu Monzaemon, one of the first professional playwrights of kabuki, produced several influential works, though the piece usually acknowledged as his most significant, Sonezaki Shinju (The Love Suicides at Sonezaki), was originally written for bunraku. Like many bunraku plays, however, it was adapted for kabuki, and it spawned many imitations; in fact, these plays reportedly caused so many real-life "copycat" suicides that the government banned shinju mono (plays about lovers' double suicides) in 1723. Ichikawa Danjuro also lived during this time; he is credited with the development of mie poses and mask-like kumadori make-up. In the mid-eighteenth century, kabuki fell out of favor for a time, with bunraku taking its place as the premier form of stage entertainment among the lower social classes. This occurred partly because of the emergence of several skilled bunraku playwrights in that time. Little of note occurred in the development of kabuki until the end of the century, when it began to re-emerge. The tremendous cultural changes begun in 1868 by the fall of the Tokugawa shogunate, the elimination of the samurai class, and the opening of Japan to the West helped to spark the re-emergence of kabuki. As the Japanese culture struggled to adapt to its new exposure to the West, actors strove to increase the reputation of kabuki among the upper classes and to adapt the traditional styles to modern tastes. They ultimately proved successful, and on one occasion, a performance was given for the Meiji Emperor. Many kabuki houses were destroyed by bombing during World War II, and the occupying forces briefly banned kabuki performances after the war. However, by 1947 the ban had been rescinded, and performances began once more. In modern Japan, kabuki remains the most popular of the traditional styles of Japanese drama and its star actors often appear in television or film roles. For example, the well-known onnagata Bando Tamasaburo V has appeared in several (non-kabuki) plays and movies, often in a female role. Some kabuki troupes now use female actors in the onnagata roles, and the Ichikawa Kabuki-za (an all-female troupe) was formed after World War II. In 2003, a statue of Okuni was erected near Kyoto's Pontochō district. 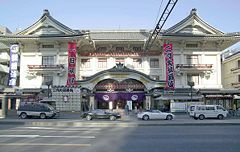 At present, regular performances are held at the Kabuki Theatre (Kabuki –za)—with a capacity of 1,600—and the National Theatre, both in Tokyo. Occasional performances are held at other theaters, and troupes of kabuki actors also perform outside of Tokyo. At the Kabuki Theatre, the length of an average program is about five hours; at the National Theatre it is about four. The Kabuki Theatre upholds the actors’ traditional position by adopting a conservative approach, planning its program around the major stars. The National Theatre stresses the importance of the play itself, in an effort to maintain the historical tradition and to preserve kabuki as a classical form. Interest in kabuki has also spread in the West. Kabuki troupes regularly tour Europe and America, and there have been several kabuki-themed productions of canonical Western plays such as those of Shakespeare. Western playwrights and novelists have also experimented with kabuki themes; an example is Gerald Vizenor's Hiroshima Bugi (2004). In Australia, the Za Kabuki troupe at the Australian National University has been performing a kabuki drama each year since 1976, the single longest regular kabuki performance outside of Japan. Kabuki was enlisted on the UNESCO's “Third Proclamation of Masterpieces of the Oral and Intangible Heritage of Humanity” on November 24, 2005. The kabuki stage features a projection called a hanamichi (花道; flower path), a walkway which extends into the audience and via which dramatic entrances and exits are made. Kabuki stages and theaters have steadily become more technologically sophisticated, and innovations including revolving stages and trap doors, introduced during the eighteenth century, added greatly to the staging of kabuki plays, in which sudden, dramatic revelation or transformation is a frequent theme. A number of stage tricks, including rapid appearances and disappearances of actors, have evolved using these innovations. The term keren (外連), often translated as "playing to the gallery," is sometimes used as a catch-all term for these tricks. In kabuki, as in some other Japanese performing arts, scenery changes are sometimes made mid-scene, while the actors remain on stage and the curtain stays open. Stage hands rush onto the stage adding and removing props, backdrops and other scenery; these stage hands, known as kuroko (黒子), are always dressed entirely in black and are traditionally considered to be "invisible." These stage hands also assist in a variety of quick costume changes known as hayagawari (quick change technique); costumes are layered one over another, and a stage assistant pulls the outer one off in front of the audience when a character’s true nature is suddenly revealed. There are three main categories of kabuki play: jidai-mono (時代物, "historical," or pre-Sengoku period stories), sewa-mono (世話物, "domestic," or post-Sengoku stories), and shosagoto (所作事, dance pieces). Important characteristics of kabuki theater include the mie (見得), in which the actor holds a picturesque pose to establish his character, or to express a particular emotion such as anger or alarm. At this point his stage name (yagō, 屋号) is sometimes heard in loud shout (kakegoe, 掛け声) from an expert audience member, serving both to express and enhance the audience's appreciation of the actor's achievement. Keshō, or makeup, is an element of style easily recognizable even by those unfamiliar with the art form. Rice powder is used to create the white oshiroi base, and kumadori enhances or exaggerates facial lines to produce dramatic animal or supernatural masks for the actors. This page was last modified on 10 April 2018, at 13:48.